• Random selection – cut the cards pick one, and do that activity. • Go through them one by one. Then go back and use your favourites. • Find four cards with the same picture and do all four. 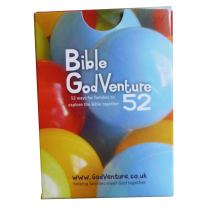 This pack contains 52 different faith building activities for families with under 5s. The activities are split into four groups: ways to share and explore stories together, ways to pray, ways to worship and ways to respond to God. They by no means cover everything you could do, and are designed to inspire families to find ways to do faith together at home in a way which suits them. Each activity could be done individually or grouped with others. Many activities could also work in a group situation and with older children, especially if extension options are given. 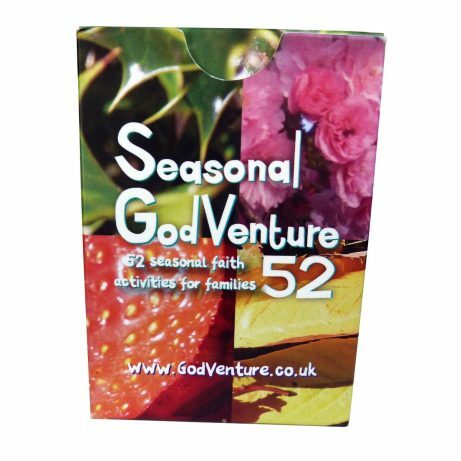 In this pack of cards are 52 fun, faith at home activities ideas for families, based around the seasons. There are 13 ideas for Summer, 13 for Autumn, 13 for Winter and 13 for Spring. The ideas are based both on the physical seasons (like frosty prayers or conker prayers), or church seasons, such as Advent, Christmas, Lent or Easter. The ideas are simple and easy to use in your context. But simple doesn’t mean banal! Simple means easy access for everyone, but the aim is always to give everyone an opportunity to connect with God. These activities are for adults and children and everyone in between. Many of them will work well with under 5s too. Remember: just because they may not be able to express their prayer in writing or speech doesn’t mean they’re not connecting! The activities will usually work in a group setting, but are designed especially for families to use at home. The cards describe the activity in enough detail to do straight away, and aim to use materials you’ll already have. 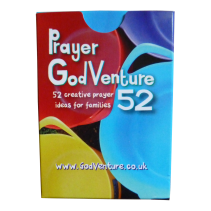 52 different ideas gives you one for each week of the year, but generally families find they discover one or two ideas which work well for their family right at this moment. So, have a look through, find the ones which are ‘really you’, and have fun with them. When you need something new, you have loads more ideas to choose from. If you like this, you might also like Bible GodVenture52 and Prayer GodVenture52.